We are half-way through the 2015 session and so far it has been moderate compared to years past. Republicans continue to fight for limited government and individual freedoms and as of right now there has been no legislation considered harmful to our constituents that has made it to the governor's desk. Click here for a copy of our mid-session review packet. The Greatest Resources for Education are Teachers (GREAT) Act creates a four-year grant program enabling school districts to offer salary bonuses to attract and retain the highest rated teachers to Colorado's lowest performing schools. Introduced and assigned to the House Education and Appropriations Committees. Mirrors a federal tax deduction for teachers, which was repealed in 2013. The bill provides a $250 deduction to offset the cost of books, supplies and computer equipment that is paid for by the teacher for use in their classroom. Passed the House Finance Committee and referred to the House Appropriations Committee. Would have allocated future budget surpluses to K-12 and higher education to help pay down the negative factor. Killed by Democrats on party-line vote. Gives district attorneys the option to prosecute a third DUI in seven years if certain aggravators are present or a fourth in a lifetime as a Class 4 felony. Passed the House Judiciary Committee and referred to Finance. Ensures Colorado regulates and taxes powdered alcohol like liquid alcohol once it receives federal approval. Passed in the Senate and awaiting repassage in the House. Protects the records of victims of domestic violence, sexual assault, and stalking. Passed the House and introduced in the Senate. Would have eliminated Punitive Damage awards authorized under HB13-1136 to level the playing field between small business and the government. Would have limited the authority of the Department of Labor and Employment to conduct audits or investigations to the intial purpose of the audit or investigation. Creates an economic working group that will make policy recommendations with the aim of stimulating economically distressed areas of Colorado. Passed House Business Affairs and referred to Appropriations. 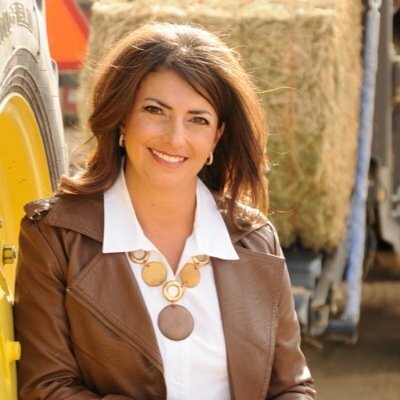 Creates the rural economic development initiative grant program to create resiliency and economic growth in rural communities. 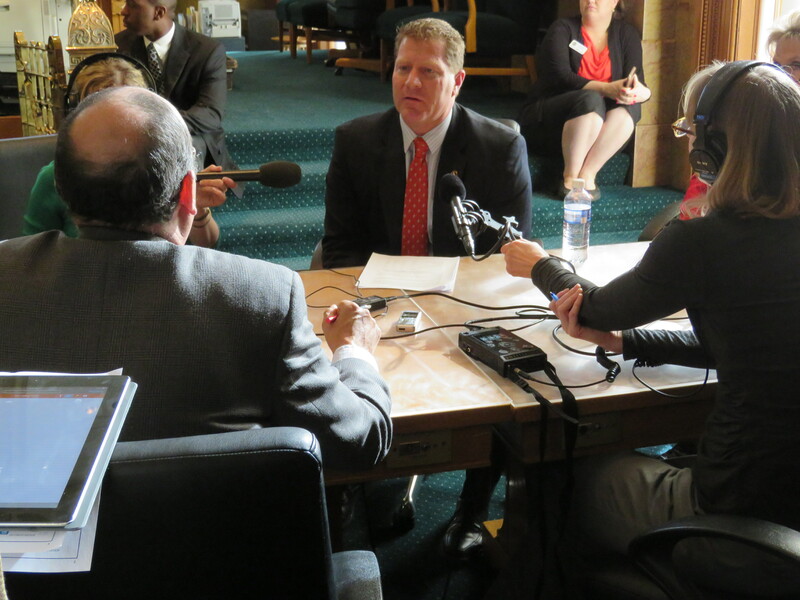 Protects previously authorized transportation funding from SB 09-228 for a full five years. Introduced and assigned to Finance and Appropriations. Would have required counties that enact fracking bans to compensate mineral rights owners for the loss of access to their property. Expands the Colorado Office of the State Auditor's oversight of Connect for Health Colorado. 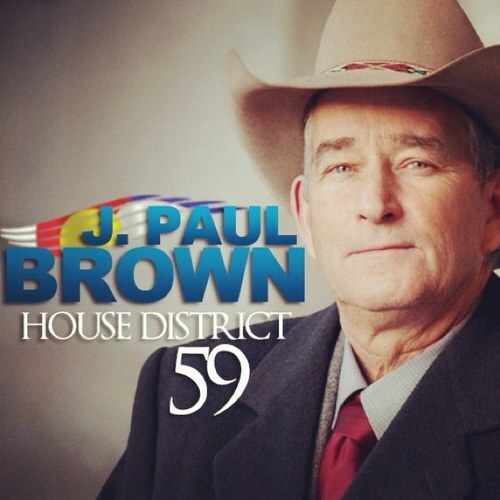 Introduced in the House and assigned to Public Health Care & Human Services. 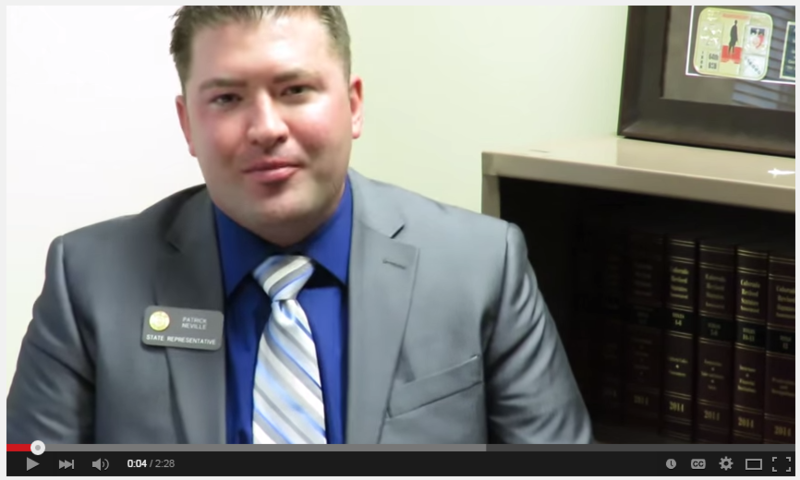 Representative Patrick Neville (R-Castle Rock) gives the weekly House GOP Update for the week of February 2-6th. 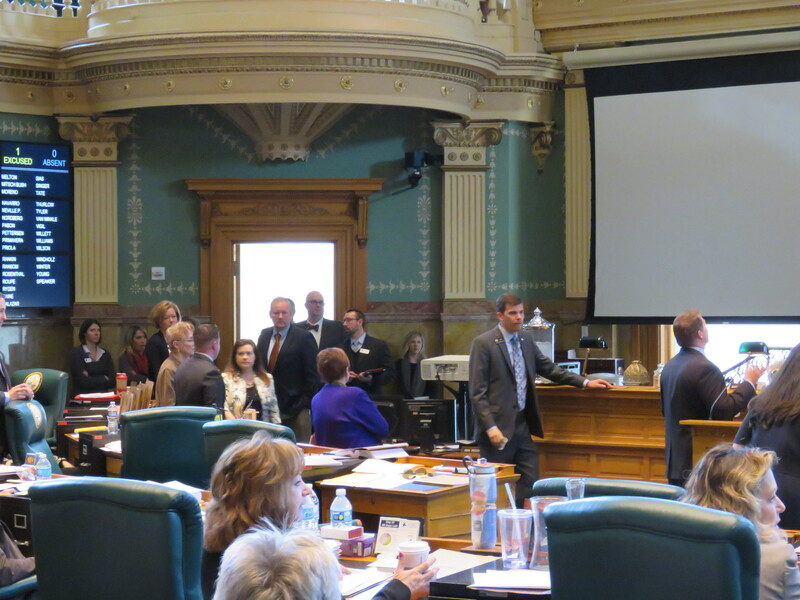 My bill for water storage on the South Platte, HB15-1167, was passed out of the House Agriculture, Livestock, and Natural Resources Committee on an 11 to 2 vote. It goes to the Appropriations Committee now because it has a pretty hefty fiscal note, but there is no more important issue in Colorado than to store water that is going out of state that can legally be used by Colorado. 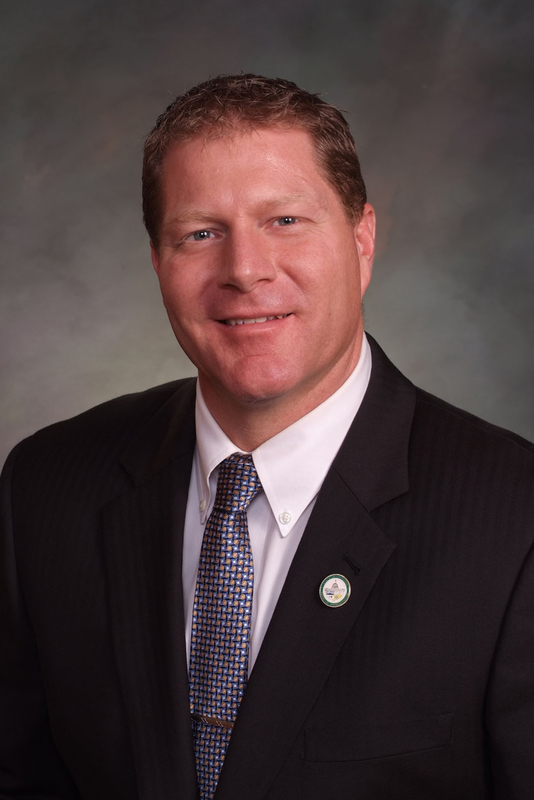 House Minority Leader Brian DelGrosso (R-Loveland) holds a press conference to discuss the progress of the legislative session at its midpoint. 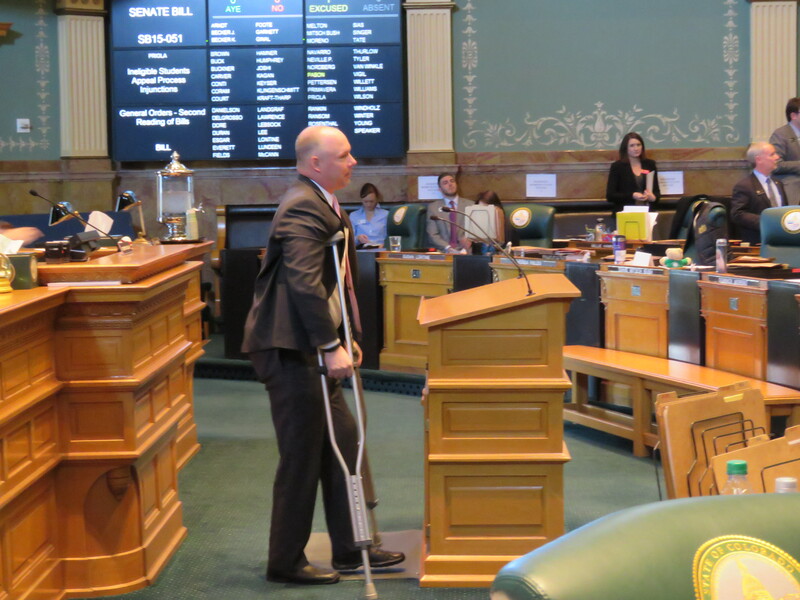 Representative Kevin Priola (R-Henderson) presents one of his bills from the well on the House Floor without the support of a leg brace. Rep. Priola suffered a severe leg injury in a skiing accident shortly before session began in January and will not be able to put weight on his leg for three more weeks. House Republicans stand up in unison to support House Bill 1114 during debate on the House Floor.